→Do Foot Detox Pads Work? The quick and easy answer to this question is that there is NO medical evidence that detox foot pads work, or that they have any benefit to you. However, they are quite popular but are surrounded by controversy, so lets look into what they are, what they claim to do and why they are fake and a scam. There are lots of fads and scams around these days, especially when it comes to looking after your health. Have you seen the herbal foot pads for sale that are supposed to draw toxins out of you while you sleep? These new overnight miracle products are supposed to be the next big thing – but do foot detox pads work? We look at the science and evidence behind these products for foot care and examine if they are beneficial or pure bunkum. This is an example photograph of what a detox-pad looks like once it has been removed from your foot. Foot pads are an adhesive “pack” that you stick to the soles of your feet overnight. The pad contains natural herbs, minerals or oils and it is designed to draw toxins from your body through your feet. The pads work via alternative medicine practices of reflexology and aromatherapy. The practice of reflexology claims that by affecting areas or zones on your feet, which map to the different areas of your body, you can improve the flow of your Qi, making physical changes to your body. 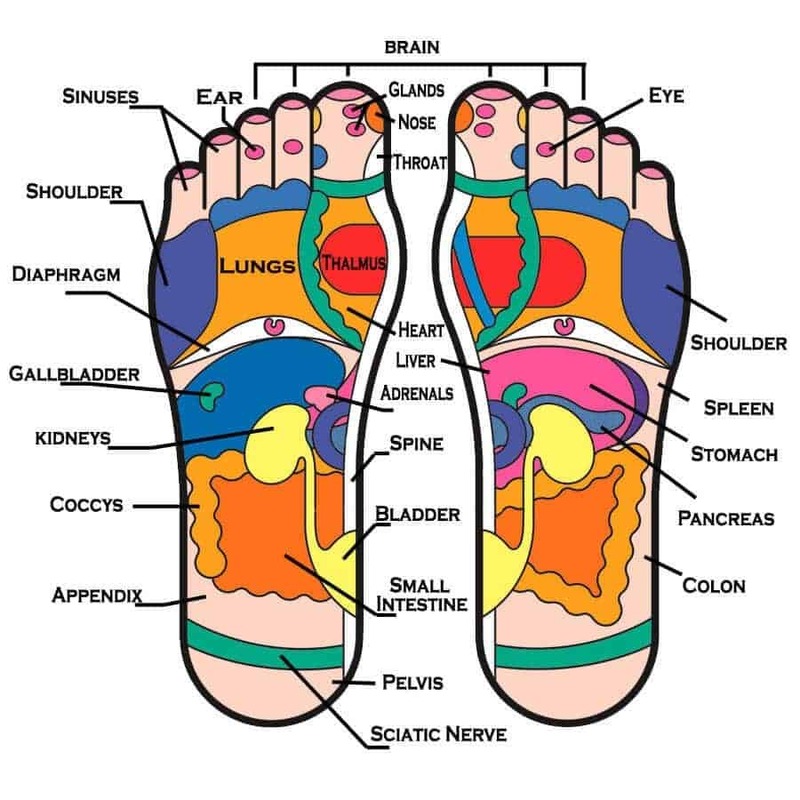 This image from the Pacific College or Oriental Medicene shows a map of your feet and where each part maps to an area of your body. This map is used as part of Reflexology practise and the detox foot pads are said to draw toxins from the affected areas. Detox foot pads are supposed to build on this idea allowing toxins and metals to flow from the affected areas, drawn out by the ingredients in the pad. After wearing the pads overnight, the toxins that are released are said to turn the pad a darker colour, supposedly proving that the process works. You can then use a colour chart to reveal which toxins were released. Some pads contain ingredients that claim to address specific issues such as giving pain relief, anti-stress. There are also foot pads to help improve your sleep. Some of the more popular ingredients you will find are Japanese Bamboo Vinegar and Lavender. The use of detoxifying foot wraps or pads is widespread in countries like China and Japan, where the use of natural medicines is more traditional and commonly used. Where is the evidence they work? Unfortunately, despite the popular manufacturers Kinoki and Avon being asked to provide evidence that their products did what they claimed, they were unable to give any valid scientific studies to support their marketing information. Many doctors and specialists have also confirmed that although practised all over the world for many centuries, reflexology has no basis in medical science. Toxins are not let out of the feet at night, and there is no evidence apart from anecdotal stories, that reflexology works. Other research showed that they might contain chemicals that cause it to turn black once they get moist. Just by adding some drops of water to the pad in a test, it became the same colour as a pad worn overnight. Many foot detox pads also claim that their products draw out and remove heavy metals from your body. However, tests found that a pad contained the same levels of metals both before and after use. FDA certified and FTC charges. To try to beat the fakery claims, some pad manufacturers have added “FDA Certified” or “Tested by an FDA laboratory” to their marketing information to make them sound more official and genuine. Despite this approval indicator, this claim is also one that you should ignore. It could mean that the combination of ingredients has been given a certificate of approval by the FDA, but not for use as a medical product. There is also some evidence that detox footpads were claiming that an FDA laboratory tests their products. However, on closer examination of this, the lab they said they used was not registered to the FDA, and the FDA did not have any evidence to support that it existed. The FTC also charged the Kinoki marketing team for “deceptive advertising” as they were claiming that their foot pads treated a range of issues from depression to diabetes but without any evidence that this was true. After the hearing in 2010, the company were fined $14.5 million and permanently prevented from marketing the Kinoki pads. Despite the fine and ruling against Kinoki, it does not mean they are not still for sale on Amazon though. Should you use detox foot pads? So, as you have read above, there is no medical evidence that wearing an adhesive pad or herbs on your foot overnight will make any difference to you or your body, apart from that you will be slightly poorer after buying them. The claims that they draw out metals and toxins from your body through your feet have been debunked and found to be illegal. The effectiveness of the pads relies on pseudoscience that cannot be proven to work. However, there are lots of success stories, and anecdotal evidence that using these products does make a difference to how people feel. There are reviews on sites like Amazon from users who have reported feeling better in the mornings and have seen both physical and mental benefits from using the pad. Despite the lack of medical and scientific evidence, people believe that these pads are detoxing their bodies. It might be a placebo effect, but it does seem to work for some people. I don’t believe I could think or will my plantar fasciitis away, so I am with the experts on this one – fake news!